This famous scene from Braveheart, based on true historical events, left every viewer wishing they could don a kilt and join the Scots in their epic battle. Mel Gibson’s portrayal of William Wallace was truly inspirational, and the motivational speech he delivered to ready his troops for battle taught us the importance of courage and fighting for what’s ours. Although we may not be heading off to fight a war each day, in the literal sense, this scene reminded us all that sometimes a little bit of courage can go a long way. A beautifully emotional journey from start to finish, this film was full of amazingly inspirational quotes. The most important, and a metaphor for the theme of the entire film, was found in this scene when Forrest details the history of his experience with running. While started as a way to protect Jenny, Forrest found that running would become a crucial part of his life, and the cause of most of his crowning achievements. Having been dealt some bad cards in life, he always found a way to find something good out of a bad situation. This movie reminded us that there is always a silver lining to every situation—we just have to look for it. The opening scene to Love Actually is an incredibly poignant one, and one of the rare times that a movie can bring a tear to your eye within the first five minutes. Hugh Grant explains, via voiceover, as we watch scenes from Heathrow Airport, how easy it is to get caught up in the negativity that surrounds our everyday lives. If you take a moment to look closely, you’ll see that there’s a lot more positivity, love, and joy than you think in the world. This message is also the central theme of the movie, as it is filled with plenty of love and joy, but also heartache and loss. Although this famous speech was delivered to a class of young men, its message can, and should, be applied to us all, regardless of age or gender. In perhaps Robin William’s most famous role of all time, he plays a maverick English teacher trying to motivate his class to seize the day and do all that they can with their lives. The lesson behind this film is that we should never just be satisfied with being okay; it’s never too late for anyone to make their lives extraordinary. Robin William’s second entrance into the list, and it’s no wonder that he was awarded the Academy Award for this. 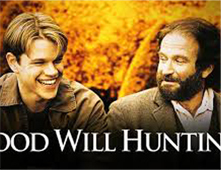 Good Will Hunting follows the story of a young, undiscovered genius dealing with inner turmoil and a troubled past. As his court-ordered psychologist, it is up to Dr Sean Maguire (Williams) to break down his wall and help him to see life differently. In this scene, Dr Maguire explains to Will that the truly amazing things in life cannot be read in a book, they have to be experienced to be believed. You should never be afraid to get hurt and put your heart on the line, it simply means that you lived your life with purpose. This cinematic masterpiece was full of life lessons and inspirational quotes, but this one was the clear standout. 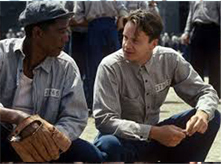 During a discussion between Red (Morgan Freeman) and Andy (Tim Robbins) about their hopes for life once they leave prison, Andy explains his very specific wishes for his future. Red’s response to Andy is that he needs to follow his dream, no matter the cost. The message here: Once we stop trying to pursue our dreams, we have already lost the battle. Words of wisdom delivered by a strange, small green creature who speaks in riddles. Sounds like a joke, of sorts, but this inspirational quote comes from one of the most popular Star Wars films, The Empire Strikes Back. This scene sees Yoda imparting some wisdom on the young Luke, as he complains about the things he cannot do. Even for those not living in a galaxy far, far, away, it’s important to take Yoda’s message to heart. Instead of focusing on what we cannot do, why not get out and do? In a time where a sense of entitlement seems to be commonplace, this inspirational quote is sure to jolt even the most self-interested soul back down to earth. In this scene, Rocky harshly, but fairly, explains to his son that to win in life you have to be prepared to put in the hard yards. We have to be responsible for making the changes in our lives so that we can reap the rewards. And, as an added bonus, the theme music for this famous film franchise is an inspiration in itself! Another gem of fatherly advice comes from Will Smith’s character, Chris, to his son in Pursuit of Happiness. This feel-good film follows the trials and tribulations of a single father, Chris, doing his absolute utmost to provide a good life for his child. In the most memorable scene, Chris takes a basketball from his son in an attempt to teach him the importance of protecting your dreams. It’s a metaphor that we can all learn from: We must fight for the things we truly believe in. It’s no wonder that Tom Hanks has made it onto this list twice. He can deliver a line so inspirational it’ll make you question your entire purpose in life. This particular scene comes after Hanks has been rescued after many years on a deserted island. He returns home to find his former fiancé has built a new life for herself, thinking that he had never survived. Hanks tells himself, and the audience, that if he can make it through his ordeal and come out alive, there’s no telling what’s possible. We must always have hope that tomorrow will bring something new and brilliant, and never, ever give up believing. If this movie didn’t have you reaching for the tissues, you’re a lot tougher than the rest of us! A devoted husband loses his life, and, once in heaven, learns that his wife died shortly after as a result of suicide. He makes the journey to hell to bring her back with him to heaven, and they learn more about each other than they ever thought possible. This film taught us all to look for that silver lining in every cloud, because there’s still a way to win even when we have lost it all. The list wouldn’t be complete with at least a couple of animated words of wisdom. Perhaps the most famous animated film of all time, The Lion King, was full of philosophical and inspirational words. Some of the most inspirational quotes come from Rafiki, the wise monkey, serving as the central source of wisdom for the entire animal kingdom. In this scene he teaches Simba, in a rather unconventional way, to learn from the past rather than run from it. There’s no point in dwelling on things that cannot change; what we must do is learn how to move forward. Sometimes inspiration can come from the movies you least expect. This scene from the comedic classic takes a break from the levity when it shows a serious conversation between Craig (Ice Cube) and his father, following a neighborhood dispute. Craig’s dad explains to him the importance of using your mind, rather than your fists, to solve your problems. It’s perfectly okay to get knocked down in life, in a metaphorical sense, but what matters most is how we handle the process of picking ourselves back up again. If Pixar has proven anything, it’s that they can make a children’s film worthy of entertaining an adult audience. While some of the movie’s inspirational messages may be lost on children until they grow a little older, this scene from Finding Nemo was very hard to miss. Feeling discouraged from his search for his son, Nemo’s father is given some sage advice from his friend, Dory. Her advice can be applied every day in the human world, too, and it’s a very easy one to remember: Just. Keep. Swimming. If there’s one thing we learned from this strange little man, is that it’s never too late in life to go for what you want. In this film, Benjamin Button was the victim of a rare disease that caused him to age backwards. However, rather than cursing the stars for this strange affliction, he grabbed life by the horns and went for his dreams. In this scene, excerpts from his diary are read aloud to his aging and dying love, words that teach us age is just a number. With everything that Benjamin Button achieved in his life, despite adversity and naysayers, it was never too late for him to chase his dreams. Yes, you read correctly! Mean Girls was an inspirational movie. The film follows the journey of a young girl starting out at a new school, learning the important things that we all go through as teenagers. While it may sound a little corny at first, the film had some amazing lines we could all learn from. In this scene, Cady, the main character, comes to the realization that tearing other people down won’t build her up. Criticizing others won’t help you in any way, so focus on your own issues at hand. Sure, we may not be on an epic quest to save Middle Earth from impending doom, but Gandalf’s advice to Frodo can still apply to each of us, hobbits or not. While we can’t control the things that happen to us in our lives, we can control how we react to them. What we choose to do with the time we are given is the true testament to a life well lived. So, take some advice from a wizard—they’re not famously wise for nothing! Yep, another chick flick! They might not be everyone’s cup of tea, but most of them can have amazingly profound messages within them. 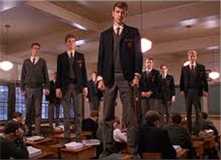 This scene encompasses the theme of the entire movie: the importance of being oneself. In a world where we are all trying to emulate and imitate in order to achieve success, we often lose sight of just how much we have to offer as a person. There can only be one you, so don’t hide it by trying to be someone else. Not only are they visually stunning and have a great story to tell, movies can be also be a source of inspiration in an unexpected place. Comedies, cartoons, epic tales, war stories, and more; inspiration can be found in just about every genre. 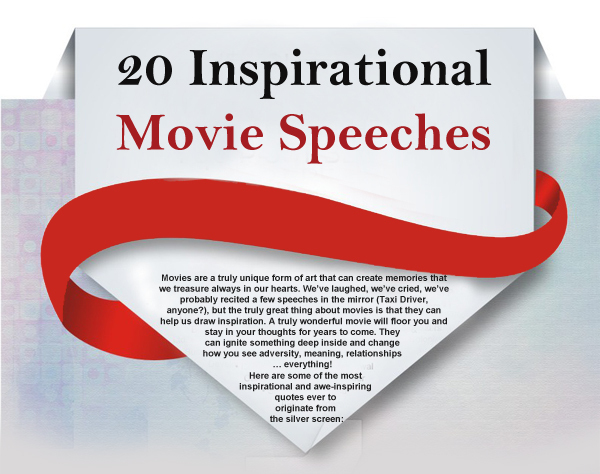 Think about your favorite film, and you’ll be surprised to find that it likely holds a special message of its own. Perhaps you missed it all these years, but it’s likely the reason why you fell in love with the film to begin with.